N64 Ucchan Nanchan no Honō no Challenge: Denryū IraIra Bō (JPN) in 05:56.65 by TASeditor. ウッチャンナンチャンの炎のチャレンジャー 電流イライラ棒 (Ucchannanchan's Passionate Challenger: Irritating Electric Rod) is a faithful recreation of the mechanical wire loop game popular in Japan, in which the player must guide an electrified rod through a path of parallel metal wires as fast as he or she can without touching the wires. This adaptation is viewed from the perspective of the end of the metal rod. There are six courses consisting of narrow pathways with curves and obstacles. 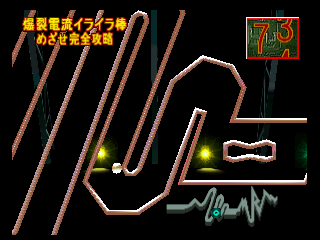 Later courses introduce moving obstacles and sections where the screen slightly tilts. Just like the real game, touching the wires results in instant loss and the gameplay is commentated by an enthusiastic announcer. This run by TASeditor improves the previous run by 0.65 second with better optimization. He also adds in some entertainment and close calls with the wires, much to the shock of the in-game announcer.